This month I’m hosting the oil pastel forum “monthly challenge.” One of the reference images was Thai-Eggplants and thought it would make a great little 5×7. I was looking for a more quiet mood for this oil pastel painting (5×7) so the surface is black Mi-Teintes Pastel Paper with a light texture. It’s a perfect surface to use Sennelier Oil Pastels since they are so buttery, but that also means there is no chance of using a solvent to make the skin of the eggplants and jug smooth – you’ll see we have a bit of texture going on with this piece as the OPs were painted straight from the stick, some parts were applied with a painters knife and other parts had clay shapers used for a smooth appearance. This entry was posted in About Oil Pastels, OPs New Paintings and tagged eggplants, green, jug, oil pastels. Bookmark the permalink. You’ve absolutely achieved the calm and smooth appearance. Quite lovely, Mary. I like the “definite-ness” of this one, the non-nonsense singular beauty of each element. I love it! Wow Dorann such a beautiful comment, thank you very much. You do have a ways with words – like the first blooming roses of a season: fresh and brilliant in color. Loved reading this first thing today, thank you! Mary I love the background on this one that bring all the still life forward specially the jug of-course the super reflaction you did on the table infront of all the items, very good. Hi Doron, thanks very much for your nice comment. I’m with you the background just kept developing and at the end by adding the indigo blues and magenta they just enhanced the piece ten-fold. The reflections were like the icing on the cake for me, I treated them just like I would with water – pulled the colors down and then swept my fingers across to show wood grain, with a bit of pastel added with clay shapers. Mary so it is all down to those megical fingers.. Have a great weekend. Thanks Doron, have a wonderful weekend! Hope you find a beautiful spot to paint. Heavy rain… but there is always tomorrow.. have a good one yourself. I love this, Mary. Just beautiful. You’re so nice – thank you very much! I mentioned to someone else that I took the photograph when it was getting quite dark and thought I could get away with it. Well seeing the painting in the day light I’m going to re-take it post again later today. 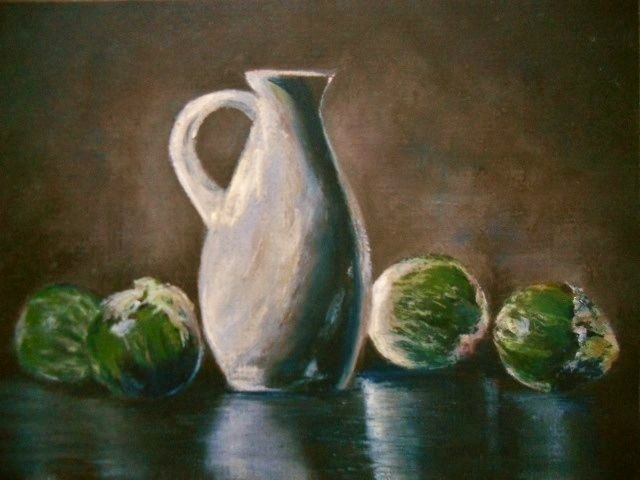 Wonderful still life, I like the light in this painting. Thanks Annie very much for your comment – appreciate it! Thanks very much for your nice comment. Actually I’ll be posting a better photograph of the painting later today, I took the photo when it was getting dark and thought I could get away with it, but seeing the painting and the posted photograph – I should re-do it. Thanks!